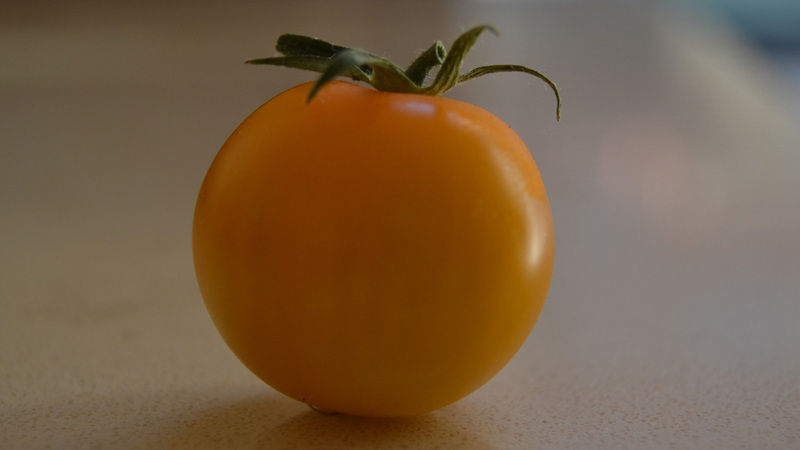 Of saffron yellow, as Corrado said, an appetizing link between Old and New World, its name is tomato. But the current one. Because when it sailed the seas on the caravels and arrived on the European shores for its yellow fruits was named mala aurea (golden apple). And people knew nothing else of that sort of eggplant, excepted the golden color that made its identity. It had the right stuff to be avoided. The similarity with the mandrake, infernal and poisonous plant, also called Satan’s apple or apple of love, gave it a bad reputation. Even worse when its rounded shape and soft pulp started to be bitten with a squirt of seeds and juice. Before reaching this stage, however, the newcomer from the Americas had to count more than 150 years considered as a merely decorative plant. Then the turn. From ornamental to good to eat and the explosion of shapes, sizes and colors we all know. Though in the end the berries brought by the conquistadors overcome the initial repulsion and prejudices to excel, in more modern times, as a key ingredient of the Mediterranean diet, some other foodstuffs are still subjected to prohibitions and restrictions. Eating according to specific rules is not a recent thing. The Bible already mentioned what was permitted to eat and what not. So the consumption, beyond the main and natural need of human beings to eat, is restricted by a set of rules that, punctuating people’s life, reveals a lot about its own identity. Cultural constructs hard to decipher, taboos elude the reins of reason and lacking any logical explanation <<Though incomprehensible to us they are taken as a matter of course by those who are under their dominance>>. From cows and calves that are sacred to Hindus to kosher food, and the distinction between clean and unclean animals among Jews, from the aversion to pork among the Muslims to the rejection to eat the horse by the Anglo-Saxons and the pets by the Westerners, above all dogs and cats, regularly cooked, on the other hand, by the Chinese: there are dishes that, here and there, are subject to absolute or temporary prohibitions. Then, if we look down on the world we would see a range of prohibitions which, while drawing the barriers, make the encounter with the “others” genuinely adventurous. Pythagoras too didn’t eat meat and was against the animal sacrifice. Suggesting his disciples to be vegetarians, he indicated to satiate with cereals, fruit, vegetables, milk and honey. Anything except the beans. <<Abstain from beans>>: it has the full force of an eleventh commandment. It was the precept that the philosopher of Samos – which, in fact, wrote 34 commandments – gave to Pythagoreans. Maybe the close resemblance to the male sexual organ, the belief that it put people into contact with the dead, or the idea that it was close to the nature of human flesh led to the prohibition not only to eat but also to touch that leguminous plant. Given that eating the fava beans is not a taboo for us, how about having a pizza which Enzo Coccia dedicated to the just ended spring? It has the name of the season which a famous Italian song called cursed and with lardo di Colonnata, buffalo mozzarella, extra virgin olive oil, fresh broad beans, asparagus and pecorino di Laticauda would seduce even Pythagoras and his followers.